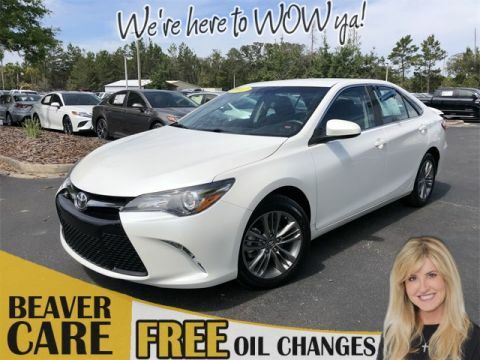 There are plenty of reasons to check out the new Toyota Camry, but for drivers in the Jacksonville area who want to save more while still getting a vehicle that feels new, a Certified Pre-Owned Toyota Camry is a great way to go. With recent Toyota Camry models having won awards like an IIHS Top Safety Pick+ recognition and Kelley Blue Book’s “Best Buy Award Finalist,” opting for a used Camry feels like a no-brainer. Plus, when you buy any CPO Toyota, you’ll enjoy a vehicle that comes backed by the Toyota Certified Used Vehicle (TCUV) program, which includes a professional inspection and a Toyota comprehensive limited warranty. 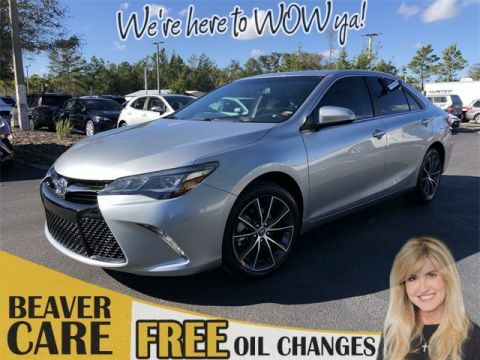 Browse our CPO Camry inventory below, and then contact Beaver Toyota in St. Augustine to find out more! CARFAX One-Owner. Certified. PRISTINE CONDITION, GPS / NAVI / NAVIGATION, SUNROOF / MOONROOF / ROOF, Leather, Bluetooth Handsfree, Rear View Camera, LEATHER, One Owner, NONSmoker, Local Trade, MUST SEE!, Fresh Oil Change, Passed 160 Point Toyota Certified Inspection, Passed Dealership Inspection, Freshly Detailed, MINT CONDITION, EXCELLENT CONDITION, GREAT DEAL ON THIS LOADED OUT CAMRY ,HAS EVERYTHING YOU NEED ,ONLY AT BEAVER CHEVROLET YOU CAN FIND A CAR LIKE THIS! !THE BEST SERVICE USED CARS IN AMERICA! !COME SEE US ,WE WANT TO WOW YOU AND WE WANT TO MAKE SURE WE SELL YUO AND YOUR FAMILY THE BEST AND SAFEST USED CARS IN THE MARKET!!. 25/35 City/Highway MPG Priced below KBB Fair Purchase Price! Silver 2014 Toyota Camry SE FWD 2.5L I4 SMPI DOHC Toyota Certified Used Vehicles Details: * Powertrain Limited Warranty: 84 Month/100,000 Mile (whichever comes first) from original in-service date * Transferable Warranty * Limited Comprehensive Warranty: 12 Month/12,000 Mile (whichever comes first) from certified purchase date. Roadside Assistance for 1 Year * Roadside Assistance * 160 Point Inspection * Warranty Deductible: $50 * Vehicle History Awards: * 2014 KBB.com 10 Best Late-Model Used Cars Under $15,000 * 2014 KBB.com 10 Best Hybrids Under $30,000 * 2014 KBB.com 10 Best Used Family Cars Under $15,000 * 2014 KBB.com Best Resale Value Awards Silver 2014 Beaver Toyota Camry SE is a 4D Sedan FWD . This Florida Sedan has a 2.5L I4 SMPI DOHC engine. Call right now and schedule a test drive. 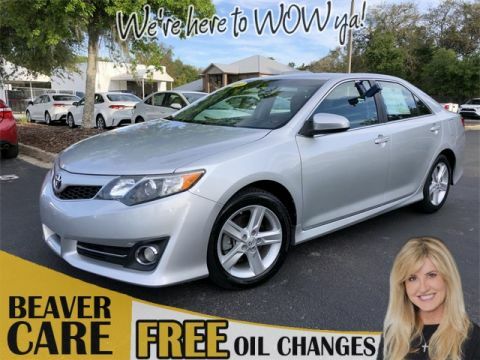 Ask for stock number 350677A, the Florida 2014 Beaver Toyota Camry . Shop Us Online at www.beavertoyotastaugustine.com. Serving Jacksonville, Palm Coast, Daytona, Gainesville and St Augustine. Beaver Toyota St Augustine on 2995 US Hwy 1 South in St Augustine. CARFAX One-Owner. Clean CARFAX. Certified. PRISTINE CONDITION, Leather, Bluetooth Handsfree, NO ACCIDENTS ON CARFAX REPORT, TOYOTA CERTIFIED*7 YEAR/100K MILE WARRANTY*$0 DEDUCTIBLE*BUY WITH PEACE OF MIND, Rear View Camera, LEATHER, One Owner, NONSmoker, Local Trade, MUST SEE!, Fresh Oil Change, Passed 160 Point Toyota Certified Inspection, Passed Dealership Inspection, Freshly Detailed, MINT CONDITION, EXCELLENT CONDITION, AT BEAVER TOYOTA OUR CERTIFIED CARS HAVE THE TOP STANDARDS IN THE MARKET !!WHY! !BECAUSE WE ARE THE TOP CERTIFIED DEALER IN THE COUNTRY! !DUE TO THIS ACHIEVEMENT CUSTOMERS CAN BUY WITH CONFIDENCE AND CAN TRUST THAT OUR USED CARS ARE THE SAFEST AND BEST PREPARED IN THE COUNTRY!!. 25/35 City/Highway MPG Priced below KBB Fair Purchase Price! Red 2016 Toyota Camry XLE FWD 2.5L I4 SMPI DOHC Toyota Certified Used Vehicles Details: * 160 Point Inspection * Transferable Warranty * Warranty Deductible: $50 * Powertrain Limited Warranty: 84 Month/100,000 Mile (whichever comes first) from original in-service date * Roadside Assistance * Limited Comprehensive Warranty: 12 Month/12,000 Mile (whichever comes first) from certified purchase date. Roadside Assistance for 1 Year * Vehicle History Awards: * 2016 KBB.com 5-Year Cost to Own Awards * 2016 KBB.com 10 Best UberX Candidates * 2016 KBB.com Best Buy Awards Finalist * 2016 KBB.com 10 Best Sedans Under $25,000 * 2016 KBB.com 10 Most Comfortable Cars Under $30,000 * 2016 KBB.com 10 Most Awarded Cars Red 2016 Beaver Toyota Camry XLE is a 4D Sedan FWD . This Florida Sedan has a 2.5L I4 SMPI DOHC engine. Call right now and schedule a test drive. Ask for stock number 029921A, the Florida 2016 Beaver Toyota Camry . Shop Us Online at www.beavertoyotastaugustine.com. Serving Jacksonville, Palm Coast, Daytona, Gainesville and St Augustine. Beaver Toyota St Augustine on 2995 US Hwy 1 South in St Augustine. CARFAX One-Owner. Certified. PRISTINE CONDITION, Bluetooth Handsfree, TOYOTA CERTIFIED*7 YEAR/100K MILE WARRANTY*$0 DEDUCTIBLE*BUY WITH PEACE OF MIND, Rear View Camera, One Owner, NONSmoker, Local Trade, MUST SEE!, Fresh Oil Change, Passed 160 Point Toyota Certified Inspection, Passed Dealership Inspection, Freshly Detailed, MINT CONDITION, EXCELLENT CONDITION, WHAT A GREAT BUY FROM THE TOP CERTIFIED DEALERSHIP IN THE COUNTRY! !OUR CERTIFIED CARS ARE THE BEST SERVICED ,BEST PREPARED AND THEY SIT AT THE TOP OF THE MARKET AS THE TOP SELLERS !!. 25/35 City/Highway MPG Blue 2015 Toyota Camry XSE FWD 2.5L I4 SMPI DOHC Toyota Certified Used Vehicles Details: * 160 Point Inspection * Warranty Deductible: $50 * Transferable Warranty * Powertrain Limited Warranty: 84 Month/100,000 Mile (whichever comes first) from original in-service date * Roadside Assistance * Limited Comprehensive Warranty: 12 Month/12,000 Mile (whichever comes first) from certified purchase date. Roadside Assistance for 1 Year * Vehicle History Awards: * 2015 KBB.com 10 Best Sedans Under $25,000 * 2015 KBB.com 15 Best Family Cars Blue 2015 Beaver Toyota Camry XSE is a 4D Sedan FWD . This Florida Sedan has a 2.5L I4 SMPI DOHC engine. Call right now and schedule a test drive. 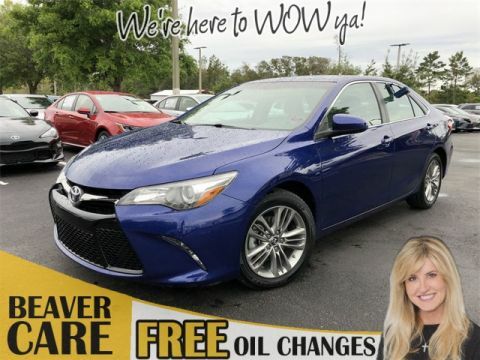 Ask for stock number U725216A, the Florida 2015 Beaver Toyota Camry . Shop Us Online at www.beavertoyotastaugustine.com. Serving Jacksonville, Palm Coast, Daytona, Gainesville and St Augustine. Beaver Toyota St Augustine on 2995 US Hwy 1 South in St Augustine. CARFAX One-Owner. Clean CARFAX. Certified. PRISTINE CONDITION, Leather, Bluetooth Handsfree, NO ACCIDENTS ON CARFAX REPORT, TOYOTA CERTIFIED*7 YEAR/100K MILE WARRANTY*$0 DEDUCTIBLE*BUY WITH PEACE OF MIND, Rear View Camera, LEATHER, One Owner, NONSmoker, Local Trade, MUST SEE!, Fresh Oil Change, Passed 160 Point Toyota Certified Inspection, Passed Dealership Inspection, Freshly Detailed, MINT CONDITION, EXCELLENT CONDITION, BEAVER TOYOTA PRESNTING YOU AND YOUR FAMILY WITH ONE OF OUR TOP CERTIFIED USED CARS IN OUR INVENTORY! !WE HAVE THE BEST CERTIFIED USED CARS ,OUR DEALERSHIP IS RANKED IN THE TOP TEN IN THE COUNTRY! !WE MAKE SURE WE PROVIDE YOU AND YOUR FAMILY WITH THE BEST AND SAFEST USED CARS IN THE MARKET! !, ABS brakes, Alloy wheels, Electronic Stability Control, Heated door mirrors, Illuminated entry, Low tire pressure warning, Remote keyless entry, Traction control. 24/33 City/Highway MPG Priced below KBB Fair Purchase Price! Gold 2017 Toyota Camry SE FWD 2.5L I4 SMPI DOHC Toyota Certified Used Vehicles Details: * Powertrain Limited Warranty: 84 Month/100,000 Mile (whichever comes first) from original in-service date * Transferable Warranty * 160 Point Inspection * Roadside Assistance * Limited Comprehensive Warranty: 12 Month/12,000 Mile (whichever comes first) from certified purchase date. Roadside Assistance for 1 Year * Vehicle History * Warranty Deductible: $50 Awards: * 2017 KBB.com 10 Most Comfortable Cars Under $30,000 * 2017 KBB.com 10 Best Sedans Under $25,000 * 2017 KBB.com 10 Most Awarded Brands * 2017 KBB.com Best Resale Value Awards Gold 2017 Beaver Toyota Camry SE is a 4D Sedan FWD . This Florida Sedan has a 2.5L I4 SMPI DOHC engine. Call right now and schedule a test drive. Ask for stock number U729080A, the Florida 2017 Beaver Toyota Camry . Shop Us Online at www.beavertoyotastaugustine.com. Serving Jacksonville, Palm Coast, Daytona, Gainesville and St Augustine. Beaver Toyota St Augustine on 2995 US Hwy 1 South in St Augustine. CARFAX One-Owner. Clean CARFAX. Certified. ABS brakes, Electronic Stability Control, Front dual zone A/C, Heated door mirrors, Heated front seats, Illuminated entry, Low tire pressure warning, Remote keyless entry, Traction control. 25/35 City/Highway MPG 2016 Toyota Camry XSE FWD 2.5L I4 SMPI DOHC Toyota Certified Used Vehicles Details: * Roadside Assistance * Warranty Deductible: $50 * 160 Point Inspection * Vehicle History * Powertrain Limited Warranty: 84 Month/100,000 Mile (whichever comes first) from original in-service date * Transferable Warranty * Limited Comprehensive Warranty: 12 Month/12,000 Mile (whichever comes first) from certified purchase date. Roadside Assistance for 1 Year Awards: * 2016 KBB.com 10 Most Comfortable Cars Under $30,000 * 2016 KBB.com 10 Best UberX Candidates * 2016 KBB.com 10 Most Awarded Cars * 2016 KBB.com Best Buy Awards Finalist * 2016 KBB.com 5-Year Cost to Own Awards * 2016 KBB.com 10 Best Sedans Under $25,000 2016 Beaver Toyota Camry XSE is a 4D Sedan FWD . This Florida Sedan has a 2.5L I4 SMPI DOHC engine. Call right now and schedule a test drive. Ask for stock number 565253, the Florida 2016 Beaver Toyota Camry . Shop Us Online at www.beavertoyotastaugustine.com. Serving Jacksonville, Palm Coast, Daytona, Gainesville and St Augustine. Beaver Toyota St Augustine on 2995 US Hwy 1 South in St Augustine. CARFAX One-Owner. Certified. ABS brakes, Alloy wheels, Electronic Stability Control, Heated door mirrors, Illuminated entry, Low tire pressure warning, Remote keyless entry, Traction control. 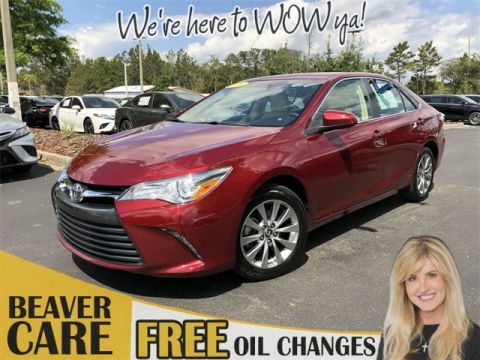 25/35 City/Highway MPG Ruby Flare Pearl 2016 Toyota Camry SE FWD 2.5L I4 SMPI DOHC Toyota Certified Used Vehicles Details: * Powertrain Limited Warranty: 84 Month/100,000 Mile (whichever comes first) from original in-service date * Vehicle History * Roadside Assistance * 160 Point Inspection * Transferable Warranty * Warranty Deductible: $50 * Limited Comprehensive Warranty: 12 Month/12,000 Mile (whichever comes first) from certified purchase date. Roadside Assistance for 1 Year Awards: * 2016 KBB.com 10 Best UberX Candidates * 2016 KBB.com 5-Year Cost to Own Awards * 2016 KBB.com 10 Most Awarded Cars * 2016 KBB.com 10 Most Comfortable Cars Under $30,000 * 2016 KBB.com Best Buy Awards Finalist * 2016 KBB.com 10 Best Sedans Under $25,000 Ruby Flare Pearl 2016 Beaver Toyota Camry SE is a 4D Sedan FWD . This Florida Sedan has a 2.5L I4 SMPI DOHC engine. Call right now and schedule a test drive. Ask for stock number 184288, the Florida 2016 Beaver Toyota Camry . Shop Us Online at www.beavertoyotastaugustine.com. Serving Jacksonville, Palm Coast, Daytona, Gainesville and St Augustine. Beaver Toyota St Augustine on 2995 US Hwy 1 South in St Augustine. CARFAX One-Owner. Clean CARFAX. Certified. PRISTINE CONDITION, Bluetooth Handsfree, NO ACCIDENTS ON CARFAX REPORT, TOYOTA CERTIFIED*7 YEAR/100K MILE WARRANTY*$0 DEDUCTIBLE*BUY WITH PEACE OF MIND, Rear View Camera, LEATHER, One Owner, NONSmoker, Local Trade, MUST SEE!, Passed 160 Point Toyota Certified Inspection, Passed Dealership Inspection, Freshly Detailed, MINT CONDITION, EXCELLENT CONDITION, AGAIN BEAVER TOYOTA HAS RECEIVED TOP HONORS ,RANKING OUR CERTIFIEDSS USED CARS IN THE TOP TEN IN THE COUNTRY!!. 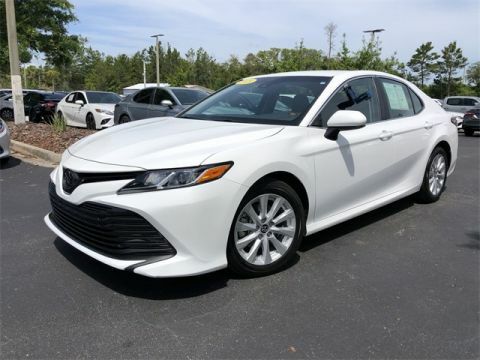 24/33 City/Highway MPG 2017 Toyota Camry SE FWD 2.5L I4 SMPI DOHC Toyota Certified Used Vehicles Details: * Limited Comprehensive Warranty: 12 Month/12,000 Mile (whichever comes first) from certified purchase date. Roadside Assistance for 1 Year * Warranty Deductible: $50 * Transferable Warranty * Roadside Assistance * 160 Point Inspection * Powertrain Limited Warranty: 84 Month/100,000 Mile (whichever comes first) from original in-service date * Vehicle History Awards: * 2017 KBB.com 10 Best Sedans Under $25,000 * 2017 KBB.com 10 Most Comfortable Cars Under $30,000 * 2017 KBB.com Best Resale Value Awards * 2017 KBB.com 10 Most Awarded Brands 2017 Beaver Toyota Camry SE is a 4D Sedan FWD . This Florida Sedan has a 2.5L I4 SMPI DOHC engine. Call right now and schedule a test drive. Ask for stock number 398392, the Florida 2017 Beaver Toyota Camry . Shop Us Online at www.beavertoyotastaugustine.com. Serving Jacksonville, Palm Coast, Daytona, Gainesville and St Augustine. Beaver Toyota St Augustine on 2995 US Hwy 1 South in St Augustine. CARFAX One-Owner. Clean CARFAX. Certified. PRISTINE CONDITION, Leather, Bluetooth Handsfree, NO ACCIDENTS ON CARFAX REPORT, TOYOTA CERTIFIED*7 YEAR/100K MILE WARRANTY*$0 DEDUCTIBLE*BUY WITH PEACE OF MIND, Rear View Camera, LEATHER, One Owner, NONSmoker, MUST SEE!, Fresh Oil Change, Passed 160 Point Toyota Certified Inspection, Freshly Detailed, MINT CONDITION, EXCELLENT CONDITION, ABS brakes, Electronic Stability Control, Front dual zone A/C, Heated door mirrors, Heated front seats, Illuminated entry, Leather Seat Trim, Low tire pressure warning, Remote keyless entry, Traction control. 25/35 City/Highway MPG Priced below KBB Fair Purchase Price! 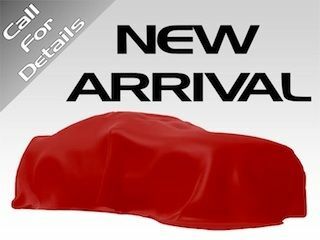 Ruby Flare Pearl 2016 Toyota Camry XLE FWD 2.5L I4 SMPI DOHC Toyota Certified Used Vehicles Details: * 160 Point Inspection * Roadside Assistance * Warranty Deductible: $50 * Transferable Warranty * Vehicle History * Powertrain Limited Warranty: 84 Month/100,000 Mile (whichever comes first) from original in-service date * Limited Comprehensive Warranty: 12 Month/12,000 Mile (whichever comes first) from certified purchase date. Roadside Assistance for 1 Year Awards: * 2016 KBB.com 10 Best Sedans Under $25,000 * 2016 KBB.com 10 Most Comfortable Cars Under $30,000 * 2016 KBB.com 10 Most Awarded Cars * 2016 KBB.com 5-Year Cost to Own Awards * 2016 KBB.com Best Buy Awards Finalist * 2016 KBB.com 10 Best UberX Candidates Ruby Flare Pearl 2016 Beaver Toyota Camry XLE is a 4D Sedan FWD . This Florida Sedan has a 2.5L I4 SMPI DOHC engine. Call right now and schedule a test drive. Ask for stock number 584533, the Florida 2016 Beaver Toyota Camry . Shop Us Online at www.beavertoyotastaugustine.com. Serving Jacksonville, Palm Coast, Daytona, Gainesville and St Augustine. Beaver Toyota St Augustine on 2995 US Hwy 1 South in St Augustine. CARFAX One-Owner. Clean CARFAX. Certified. ABS brakes, Alloy wheels, Electronic Stability Control, Heated door mirrors, Illuminated entry, Low tire pressure warning, Remote keyless entry, Traction control. 25/35 City/Highway MPG 2016 Toyota Camry SE FWD 2.5L I4 SMPI DOHC Toyota Certified Used Vehicles Details: * 160 Point Inspection * Roadside Assistance * Transferable Warranty * Limited Comprehensive Warranty: 12 Month/12,000 Mile (whichever comes first) from certified purchase date. Roadside Assistance for 1 Year * Warranty Deductible: $50 * Vehicle History * Powertrain Limited Warranty: 84 Month/100,000 Mile (whichever comes first) from original in-service date Awards: * 2016 KBB.com 10 Most Awarded Cars * 2016 KBB.com Best Buy Awards Finalist * 2016 KBB.com 10 Best Sedans Under $25,000 * 2016 KBB.com 10 Most Comfortable Cars Under $30,000 * 2016 KBB.com 5-Year Cost to Own Awards * 2016 KBB.com 10 Best UberX Candidates 2016 Beaver Toyota Camry SE is a 4D Sedan FWD . This Florida Sedan has a 2.5L I4 SMPI DOHC engine. Call right now and schedule a test drive. Ask for stock number 556850, the Florida 2016 Beaver Toyota Camry . Shop Us Online at www.beavertoyotastaugustine.com. Serving Jacksonville, Palm Coast, Daytona, Gainesville and St Augustine. Beaver Toyota St Augustine on 2995 US Hwy 1 South in St Augustine. CARFAX One-Owner. Clean CARFAX. Certified. PRISTINE CONDITION, Bluetooth Handsfree, NO ACCIDENTS ON CARFAX REPORT, TOYOTA CERTIFIED*7 YEAR/100K MILE WARRANTY*$0 DEDUCTIBLE*BUY WITH PEACE OF MIND, Rear View Camera, One Owner, NONSmoker, Local Trade, MUST SEE!, Fresh Oil Change, Passed Dealership Inspection, Freshly Detailed, MINT CONDITION, EXCELLENT CONDITION. 28/39 City/Highway MPG Priced below KBB Fair Purchase Price! Super White 2018 Toyota Camry LE FWD 2.5L I4 DOHC 16V Toyota Certified Used Vehicles Details: * Limited Comprehensive Warranty: 12 Month/12,000 Mile (whichever comes first) from certified purchase date. 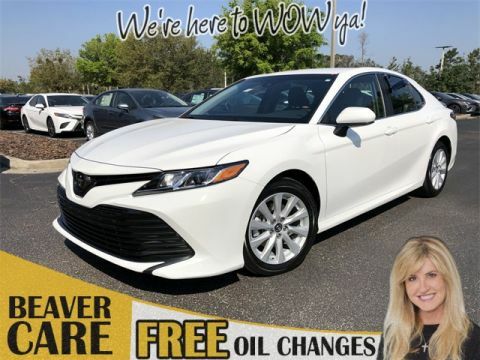 Roadside Assistance for 1 Year * 160 Point Inspection * Powertrain Limited Warranty: 84 Month/100,000 Mile (whichever comes first) from original in-service date * Roadside Assistance * Warranty Deductible: $50 * Vehicle History * Transferable Warranty Super White 2018 Beaver Toyota Camry LE is a 4D Sedan FWD . This Florida Sedan has a 2.5L I4 DOHC 16V engine. Call right now and schedule a test drive. Ask for stock number 591704, the Florida 2018 Beaver Toyota Camry . Shop Us Online at www.beavertoyotastaugustine.com. Serving Jacksonville, Palm Coast, Daytona, Gainesville and St Augustine. Beaver Toyota St Augustine on 2995 US Hwy 1 South in St Augustine. Clean CARFAX. Certified. PRISTINE CONDITION, GPS / NAVI / NAVIGATION, SUNROOF / MOONROOF / ROOF, Leather, Bluetooth Handsfree, NO ACCIDENTS ON CARFAX REPORT, TOYOTA CERTIFIED*7 YEAR/100K MILE WARRANTY*$0 DEDUCTIBLE*BUY WITH PEACE OF MIND, Rear View Camera, One Owner, NONSmoker, Local Trade, MUST SEE!, New Tires, Passed 160 Point Toyota Certified Inspection, Passed Dealership Inspection, Freshly Detailed, MINT CONDITION, VERY HARD CAR TO FIND ,ABSOLUTELY NEW ,ALL THE EYES ,ALL THE EQUIPMENT ,TOP CERTIFIED DEALERSHIP IN THE COUNTRY!! ,WE HAVE THE BEST INVENTORY IN THE COUNTRY!! THE BEST SERVICED CARS IN THE MARKET! !, ABS brakes, Compass, Electronic Stability Control, Front dual zone A/C, Heated door mirrors, Heated front seats, Illuminated entry, Low tire pressure warning, Navigation System, Power moonroof, Remote keyless entry, Traction control. 21/31 City/Highway MPG Super White 2016 Toyota Camry XSE V6 FWD 3.5L V6 SMPI DOHC Toyota Certified Used Vehicles Details: * Powertrain Limited Warranty: 84 Month/100,000 Mile (whichever comes first) from original in-service date * Vehicle History * Roadside Assistance * Warranty Deductible: $50 * Transferable Warranty * 160 Point Inspection * Limited Comprehensive Warranty: 12 Month/12,000 Mile (whichever comes first) from certified purchase date. Roadside Assistance for 1 Year Awards: * 2016 KBB.com Best Buy Awards Finalist * 2016 KBB.com 5-Year Cost to Own Awards * 2016 KBB.com 10 Best Sedans Under $25,000 * 2016 KBB.com 10 Best UberX Candidates * 2016 KBB.com 10 Most Comfortable Cars Under $30,000 * 2016 KBB.com 10 Most Awarded Cars Super White 2016 Beaver Toyota Camry XSE V6 is a 4D Sedan FWD . This Florida Sedan has a 3.5L V6 SMPI DOHC engine. Call right now and schedule a test drive. Ask for stock number 572227, the Florida 2016 Beaver Toyota Camry . Shop Us Online at www.beavertoyotastaugustine.com. Serving Jacksonville, Palm Coast, Daytona, Gainesville and St Augustine. Beaver Toyota St Augustine on 2995 US Hwy 1 South in St Augustine. CARFAX One-Owner. Certified. PRISTINE CONDITION, Bluetooth Handsfree, TOYOTA CERTIFIED*7 YEAR/100K MILE WARRANTY*$0 DEDUCTIBLE*BUY WITH PEACE OF MIND, Rear View Camera, One Owner, NONSmoker, MUST SEE!, Fresh Oil Change, Passed Dealership Inspection, Freshly Detailed, EXCELLENT CONDITION, ANOTHER TOP CERTIFIED USED CAR FROM THE TOP TOYOTA CERTIFIED DEALER IN THE COUNTRY! !COME SEE US TO BUY THE BEST USED CARS OFFRED IN THE MARKET! !BEAVER TOYOTA THE TOP USED CAR DEALERSHIP IN THE MARKET,WERE THE USED CARS MAKE THEIR NAME! !WE HAVE THE BEST WE ONLY SELL THE BEST!!. 28/39 City/Highway MPG 2018 Toyota Camry LE FWD 2.5L I4 DOHC 16V Toyota Certified Used Vehicles Details: * Powertrain Limited Warranty: 84 Month/100,000 Mile (whichever comes first) from original in-service date * Limited Comprehensive Warranty: 12 Month/12,000 Mile (whichever comes first) from certified purchase date. 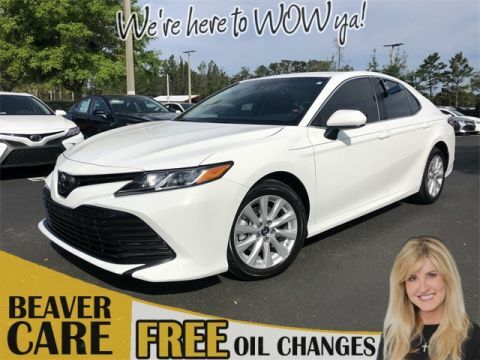 Roadside Assistance for 1 Year * Vehicle History * Warranty Deductible: $50 * 160 Point Inspection * Transferable Warranty * Roadside Assistance 2018 Beaver Toyota Camry LE is a 4D Sedan FWD . This Florida Sedan has a 2.5L I4 DOHC 16V engine. Call right now and schedule a test drive. Ask for stock number 583668, the Florida 2018 Beaver Toyota Camry . Shop Us Online at www.beavertoyotastaugustine.com. Serving Jacksonville, Palm Coast, Daytona, Gainesville and St Augustine. Beaver Toyota St Augustine on 2995 US Hwy 1 South in St Augustine. CARFAX One-Owner. Clean CARFAX. Certified. PRISTINE CONDITION, Bluetooth Handsfree, NO ACCIDENTS ON CARFAX REPORT, TOYOTA CERTIFIED*7 YEAR/100K MILE WARRANTY*$0 DEDUCTIBLE*BUY WITH PEACE OF MIND, Rear View Camera, One Owner, NONSmoker, Local Trade, MUST SEE!, New Tires, New Brakes, Fresh Oil Change, Passed 160 Point Toyota Certified Inspection, Passed Dealership Inspection, Freshly Detailed, MINT CONDITION, EXCELLENT CONDITION, ABS brakes, Alloy wheels, Electronic Stability Control, Heated door mirrors, Illuminated entry, Low tire pressure warning, Remote keyless entry, Traction control. 25/35 City/Highway MPG Blue Crush Metallic 2016 Toyota Camry SE FWD 2.5L I4 SMPI DOHC Toyota Certified Used Vehicles Details: * Powertrain Limited Warranty: 84 Month/100,000 Mile (whichever comes first) from original in-service date * Transferable Warranty * 160 Point Inspection * Limited Comprehensive Warranty: 12 Month/12,000 Mile (whichever comes first) from certified purchase date. Roadside Assistance for 1 Year * Vehicle History * Warranty Deductible: $50 * Roadside Assistance Awards: * 2016 KBB.com 10 Most Awarded Cars * 2016 KBB.com 10 Best Sedans Under $25,000 * 2016 KBB.com 10 Best UberX Candidates * 2016 KBB.com 5-Year Cost to Own Awards * 2016 KBB.com Best Buy Awards Finalist * 2016 KBB.com 10 Most Comfortable Cars Under $30,000 Blue Crush Metallic 2016 Beaver Toyota Camry SE is a 4D Sedan FWD . This Florida Sedan has a 2.5L I4 SMPI DOHC engine. Call right now and schedule a test drive. 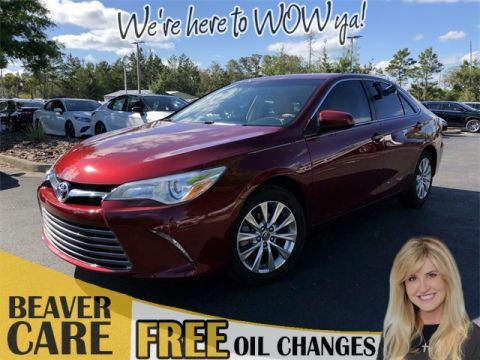 Ask for stock number 560170, the Florida 2016 Beaver Toyota Camry . Shop Us Online at www.beavertoyotastaugustine.com. Serving Jacksonville, Palm Coast, Daytona, Gainesville and St Augustine. Beaver Toyota St Augustine on 2995 US Hwy 1 South in St Augustine. CARFAX One-Owner. Clean CARFAX. Certified. PRISTINE CONDITION, Bluetooth Handsfree, NO ACCIDENTS ON CARFAX REPORT, TOYOTA CERTIFIED*7 YEAR/100K MILE WARRANTY*$0 DEDUCTIBLE*BUY WITH PEACE OF MIND, Rear View Camera, One Owner, NONSmoker, Local Trade, MUST SEE!, Fresh Oil Change, Passed 160 Point Toyota Certified Inspection, Passed Dealership Inspection, Freshly Detailed, MINT CONDITION, EXCELLENT CONDITION. 28/39 City/Highway MPG 2018 Toyota Camry LE FWD 2.5L I4 DOHC 16V Toyota Certified Used Vehicles Details: * 160 Point Inspection * Roadside Assistance * Vehicle History * Limited Comprehensive Warranty: 12 Month/12,000 Mile (whichever comes first) from certified purchase date. 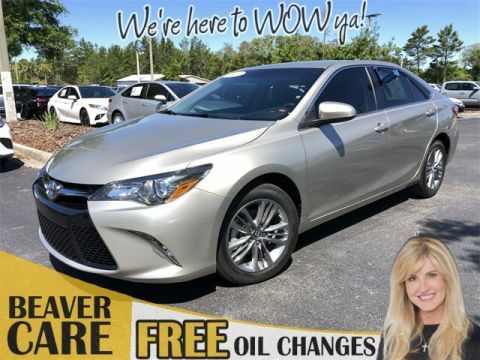 Roadside Assistance for 1 Year * Transferable Warranty * Powertrain Limited Warranty: 84 Month/100,000 Mile (whichever comes first) from original in-service date * Warranty Deductible: $50 2018 Beaver Toyota Camry LE is a 4D Sedan FWD . This Florida Sedan has a 2.5L I4 DOHC 16V engine. Call right now and schedule a test drive. 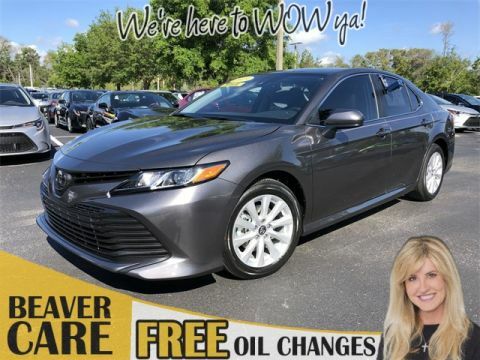 Ask for stock number 127605, the Florida 2018 Beaver Toyota Camry . Shop Us Online at www.beavertoyotastaugustine.com. Serving Jacksonville, Palm Coast, Daytona, Gainesville and St Augustine. Beaver Toyota St Augustine on 2995 US Hwy 1 South in St Augustine. CARFAX One-Owner. Clean CARFAX. Certified. PRISTINE CONDITION, Bluetooth Handsfree, NO ACCIDENTS ON CARFAX REPORT, Rear View Camera, One Owner, NONSmoker, Local Trade, MUST SEE!, Fresh Oil Change, Passed Dealership Inspection, Freshly Detailed, MINT CONDITION, EXCELLENT CONDITION, LIKE NEW ,SAVE THOUSANDS ,THE BEST CARS IN THE MARKET ARE HERE AT BEAVER TOYOTA!!. 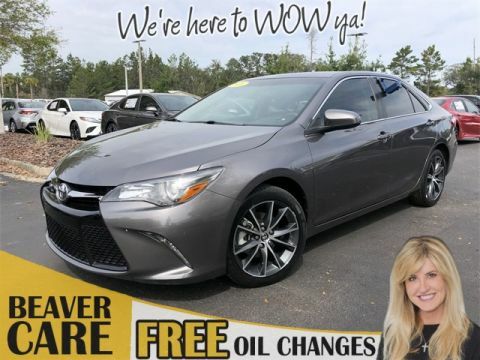 28/39 City/Highway MPG Predawn Gray Mica 2019 Toyota Camry LE FWD 2.5L I4 DOHC 16V Toyota Certified Used Vehicles Details: * Transferable Warranty * Roadside Assistance * Vehicle History * 160 Point Inspection * Limited Comprehensive Warranty: 12 Month/12,000 Mile (whichever comes first) from certified purchase date. 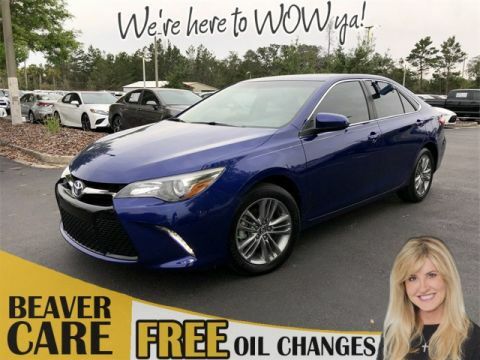 Roadside Assistance for 1 Year * Powertrain Limited Warranty: 84 Month/100,000 Mile (whichever comes first) from original in-service date * Warranty Deductible: $50 Predawn Gray Mica 2019 Beaver Toyota Camry LE is a 4D Sedan FWD . This Florida Sedan has a 2.5L I4 DOHC 16V engine. Call right now and schedule a test drive. 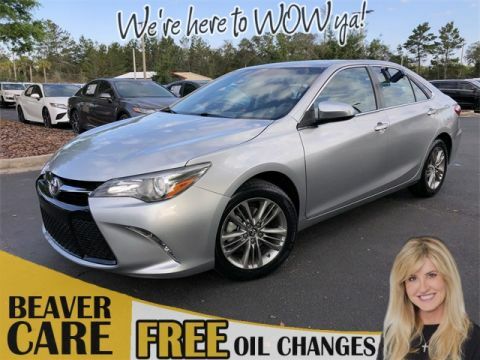 Ask for stock number U739765A, the Florida 2019 Beaver Toyota Camry . Shop Us Online at www.beavertoyotastaugustine.com. Serving Jacksonville, Palm Coast, Daytona, Gainesville and St Augustine. Beaver Toyota St Augustine on 2995 US Hwy 1 South in St Augustine. CARFAX One-Owner. Clean CARFAX. Certified. PRISTINE CONDITION, Leather, Bluetooth Handsfree, NO ACCIDENTS ON CARFAX REPORT, TOYOTA CERTIFIED*7 YEAR/100K MILE WARRANTY*$0 DEDUCTIBLE*BUY WITH PEACE OF MIND, Rear View Camera, LEATHER, One Owner, NONSmoker, MUST SEE!, Fresh Oil Change, Passed Dealership Inspection, Freshly Detailed, MINT CONDITION, EXCELLENT CONDITION, CERTIFIED USED CARS AT BEAVER TOYOTA ARE AT THE TOP OF THE WORLD! !WE ARE RANKED TOP TEN IN THE COUNTRY! !WE ONLY SELL THE BEST SERVICED AND PREPARED CARS IN AMERICA! !BEAVER TOYOTA THE ONLY PLACE TO BUY A USED CAR11. 28/39 City/Highway MPG Midnight Black Metallic/Wind Chill 2018 Toyota Camry SE FWD 2.5L I4 DOHC 16V Toyota Certified Used Vehicles Details: * Powertrain Limited Warranty: 84 Month/100,000 Mile (whichever comes first) from original in-service date * Transferable Warranty * Vehicle History * Warranty Deductible: $50 * 160 Point Inspection * Roadside Assistance * Limited Comprehensive Warranty: 12 Month/12,000 Mile (whichever comes first) from certified purchase date. Roadside Assistance for 1 Year Midnight Black Metallic/Wind Chill 2018 Beaver Toyota Camry SE is a 4D Sedan FWD . This Florida Sedan has a 2.5L I4 DOHC 16V engine. Call right now and schedule a test drive. Ask for stock number 087509, the Florida 2018 Beaver Toyota Camry . Shop Us Online at www.beavertoyotastaugustine.com. Serving Jacksonville, Palm Coast, Daytona, Gainesville and St Augustine. Beaver Toyota St Augustine on 2995 US Hwy 1 South in St Augustine. CARFAX One-Owner. Clean CARFAX. Certified. ABS brakes, Alloy wheels, Electronic Stability Control, Heated door mirrors, Illuminated entry, Low tire pressure warning, Remote keyless entry, Traction control. 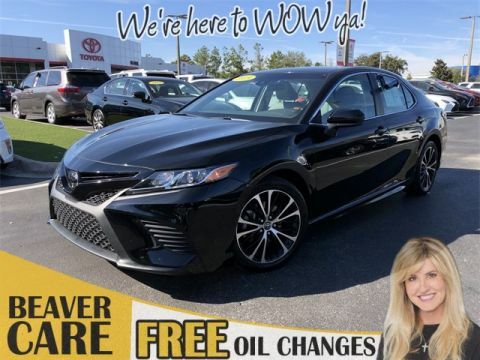 25/35 City/Highway MPG 2016 Toyota Camry SE FWD 2.5L I4 SMPI DOHC Toyota Certified Used Vehicles Details: * 160 Point Inspection * Roadside Assistance * Limited Comprehensive Warranty: 12 Month/12,000 Mile (whichever comes first) from certified purchase date. Roadside Assistance for 1 Year * Warranty Deductible: $50 * Vehicle History * Transferable Warranty * Powertrain Limited Warranty: 84 Month/100,000 Mile (whichever comes first) from original in-service date Awards: * 2016 KBB.com 10 Most Awarded Cars * 2016 KBB.com Best Buy Awards Finalist * 2016 KBB.com 10 Best Sedans Under $25,000 * 2016 KBB.com 10 Best UberX Candidates * 2016 KBB.com 5-Year Cost to Own Awards * 2016 KBB.com 10 Most Comfortable Cars Under $30,000 2016 Beaver Toyota Camry SE is a 4D Sedan FWD . This Florida Sedan has a 2.5L I4 SMPI DOHC engine. Call right now and schedule a test drive. Ask for stock number 247443, the Florida 2016 Beaver Toyota Camry . Shop Us Online at www.beavertoyotastaugustine.com. Serving Jacksonville, Palm Coast, Daytona, Gainesville and St Augustine. Beaver Toyota St Augustine on 2995 US Hwy 1 South in St Augustine. 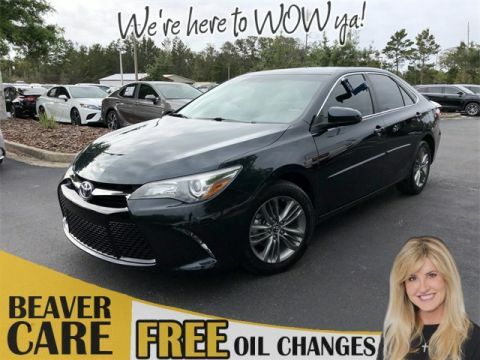 You’ll find a variety of Certified Pre-Owned Toyota Camry sedans on sale at Beaver Toyota in St. Augustine, including some models that come equipped with advanced Entune™ infotainment systems, V6 engines, and the latest in driver assistance safety. Even more exciting is that, in addition to the advantages that come with the TCUV program, you’ll also get special Beaver Toyota benefits like a 5-day exchange policy, our Guaranteed Wow Price, and financing that suits your budget. Visit our dealership today, and experience the many perks of shopping with us!